Many recipes call for some type of wheat-based flour, whether whole-wheat, all-purpose or cake flour, but you can successfully replace wheat flour with chickpea flour. It adds a nutty taste and a boost of protein, and it works well in any dish, from baked goods to soups and sauces. Chickpea flour also makes a good alternative if you're following a wheat-free or gluten-free diet. Chickpea flour is nothing more than dried chickpeas, ground to a flour-like consistency. Other names for chickpea flour include gram flour, cici flour and garbanzo bean flour. Besan is chickpea flour made with unroasted chickpeas. Chana is flour made from roasted chickpeas. Even though it's naturally gluten-free, flour is easily cross-contaminated if it's produced or used in close proximity to wheat flour. Look for a gluten-free statement on the package, which means it complies with U.S. Food and Drug Administration standards for gluten-free products. One cup of chickpea flour contains 356 calories, 21 grams of protein, 6 grams of total fat and 53 grams of total carbohydrates, according to the USDA Nutrient Database. It has fewer calories and carbs than either whole-wheat or all-purpose white flour, yet it's a better source of protein. Chickpea flour has double the amount of protein than whole-wheat flour and six times more than all-purpose flour. It's an excellent source of folate, containing seven times more folate than whole-wheat flour. It even has more folate than enriched all-purpose flour. It also provides vitamin B-6, iron, magnesium and potassium. If your grocery store has an extensive international foods section, you may find chickpea flour in the Indian foods section under the names gram flour, besan or chana flour. Most groceries that sell Indian foods and ingredients carry chickpea flour, since many Indian foods use it as a main ingredient. Health food stores also carry a variety of non-wheat and gluten-free flours, often including chickpea flour. If you can't find it locally, look for it through a health food supplier or co-op online. All you need to make your own chickpea flour is a blender or food processor and dried chickpeas, which you can find with dried beans and peas at any supermarket. Rinse the chickpeas with clear water, then either let them dry overnight or spread them on a cookie sheet and toast them for 15 to 20 minutes in a hot oven. Process the dried chickpeas in a blender or food processor in small batches until they are the consistency of flour. 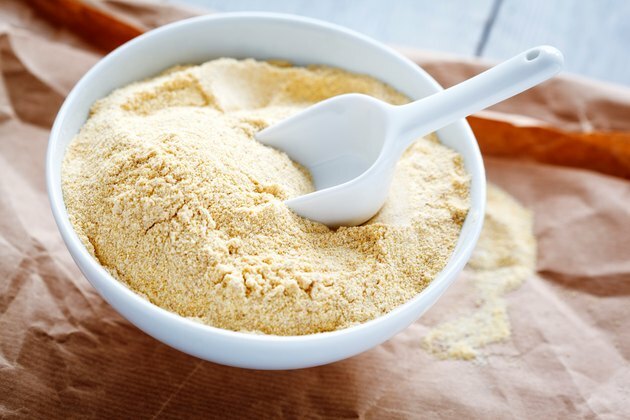 Store the chickpea flour in a closed container in your refrigerator or freezer. A 1-pound package of dried chickpeas makes about 2 cups of chickpea flour. You can substitute 7/8 cup of chickpea flour for every 1 cup of wheat flour, according to Michigan State University. Depending on how you're using the flour, you may get better results by mixing it with other flours. Try mixing bean flour with rice flour, or if you're baking something sweet, mix chickpea flour, sorghum flour and sweet rice flour. Sometimes you'll need to adjust the amount of fluids because chickpea flour may absorb more or less fluid than other flours. For yeast breads, add xanthan or guar gum to replace the gluten.